Deep down the seas, in the deep blue, there exists a wonderful unknown world, one of enchanting beauty. The few that visit it experience the sensation of being accepted into a silent paradise, filled with infinite forms and colours and myriads of sea species. Undersea caves, great reefs,ancient sunken towns,make up an invisible world, yet pulsating and alive. The entrancing iridescence of the sunlight, diffracted by the crystal-clear waters, the sense of peace and eternity prevailing beneath the surface of the sea, the reduction in human weight lending a sensation of flight and freedom, all make diving an exhilarating experience. 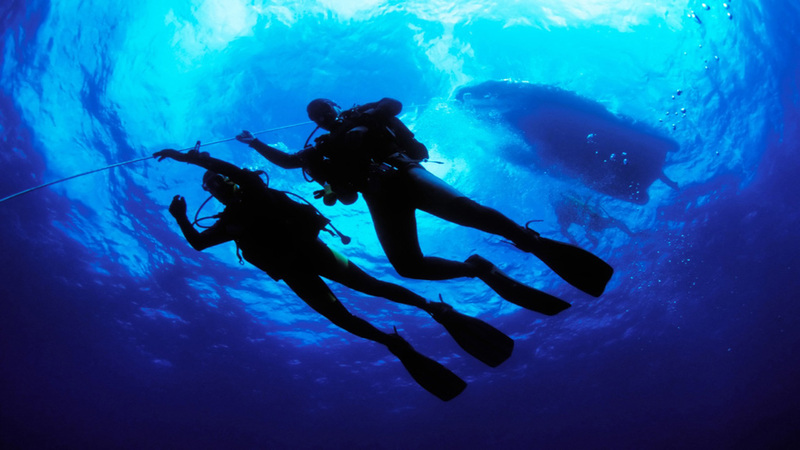 The Greek sea is recorded as the cleanest in the Mediterranean.Thus, diving into the “big blue” of Greece represents a unique experience for those who attempt it, provided they have prior training and special precautions are taken. On board our vessels you will find standard snorkeling equipment ( masks, flippers etc) but we can arrange scuba diving sessions upon request. Crete is all about sea, an aquatic heaven, full of life. With a coastline that stretches from Chania to Sitia, Crete is a fishing paradise. Fishing and exploring the coast by boat is one of the most magical ways of seeing Crete. Hundreds of rocky coves, small bays, and the imposing island of Dia just 7 NM from the Harbour of Heraklion, make a fantastic view for those lucky enough to be afloat while the walls, gorges and caverns of the sea’s bottom (a result of the continuous volcanic formations of the past) the clear waters, mild weather conditions and the high temperature make a super habitat for hundreds of different marine species. Our Yachts provide standard non – professional fishing equipment.